The cover of this CD from Colombian Guerra Total almost kept me from even listening. It looks so much underground that I reckoned it wouldn't at all be anything for me. That of course paired with the low-quality pictures of the two musicians at the back of the booklet. Anyway, all bands always get a fair chance here at The Power Of Metal.dk, so I've listened. It should be no secret that this isn't my favourite kind of thrash metal - the vocals are not at all my cup of tea and I like a production that's better than what is on offer on 'Mas Allá de la Tumba'. 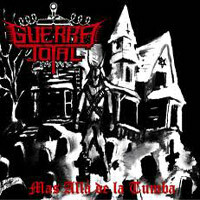 That said, Guerra Total are surprisingly tight and you certainly can't blame them for lacking spirit as well as the ability to surprise (take the intro of the title track as an example). This is worth checking out if you like underground metal of the mid- to late eighties with a heavy German influence. It's not going to be a classic in my world, but I could easily see some metalheads out there enjoying this.